Barcode Scanner Software-6 Must have Barcode Scanner software for every budget and need. Barcode are generally some secret code which is used in our day to day life in all occupations. It is a machine-readable code in the form of numbers and pattern of parallel lines of different widths, generally printed on a product. For decoding them you need a barcode scanning machine, which can read them quickly. But if we want to scan them on our computers, then we need different Barcode Scanner Software. Have a look at the listed Barcode Scanner software and get the one which can serve you accordingly. This software scans multiple barcodes like GIF, PDF, TIF, JPG, PNG, BMP file formats. After the scanning process is completed, it supplies the details of each barcode type for example barcode type and code. It can read barcode from TIFF, images, JPG and PDF. New types of barcode supports like GTIN-12, Code-93, MSI, GTIN-8 and GTIN-14. This software is a different scanning software, it uses the mouse for scanning the image of barcode. After opening this software, it creates a red ring around the mouse icon. When the barcode comes within the ring it turns to green and after that a barcode text is generated. It makes barcode scanning easier. 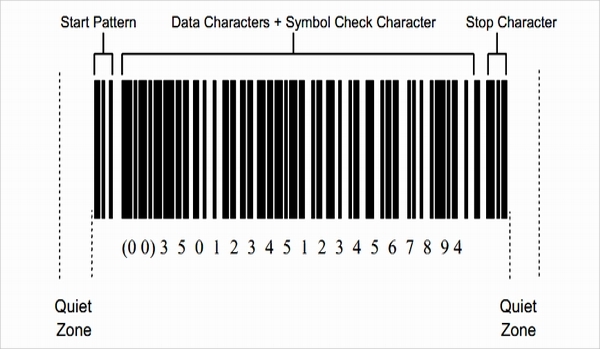 It can decode different types of barcode like EAN 13, UPAC-A, DataLogic2of5, BCDMatric, etc. 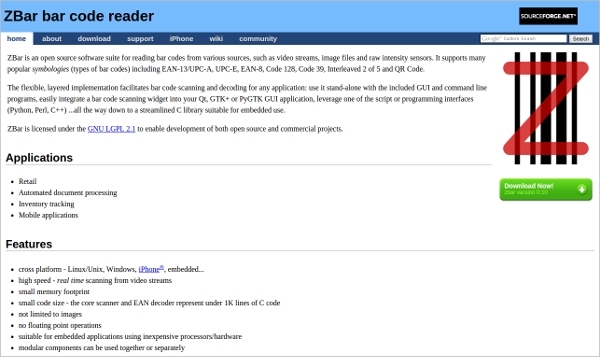 It is basically an open source tool for barcode scanning from different sources like image files, video streams, raw intensity sensors and image files. It supports different types of bar codes like Code-39, Code 128, UPS-E, EAN-13, Interleaved 2 of 5 and OR Code. 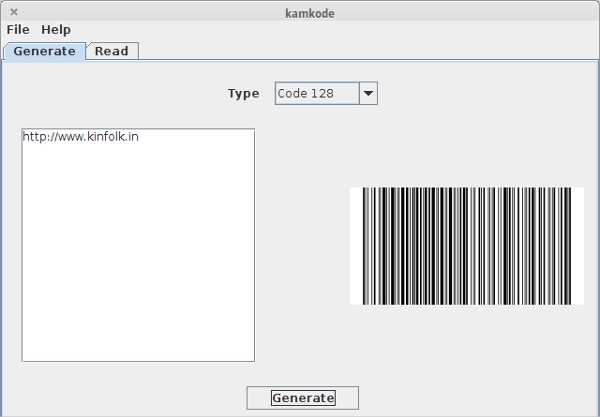 It is basically a barcode scanner and generator software tool based on java application. From the computer webcam it can scan barcode image. It can even detect one and two dimensional barcodes. In your system you will need a Java software installed to run this software. Compatible with Windows and Linux OS. Pure Java libraries are used. 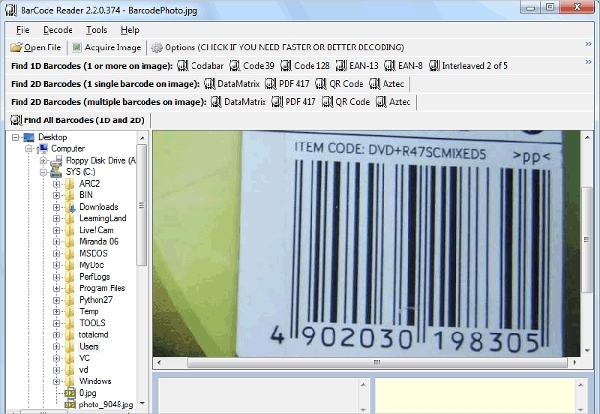 This software can scan 9 different barcode images and provide details of the image preview. It can decode from JPEG, TIFF, PNG, GIF, etc to barcodes like EAN, Interleaved 2 of 5, Code128, etc. It a small and portable software with a setup file of 600KB. Supported barcode types are UPC-E, UPC-A, Code-11, Code-93, etc. 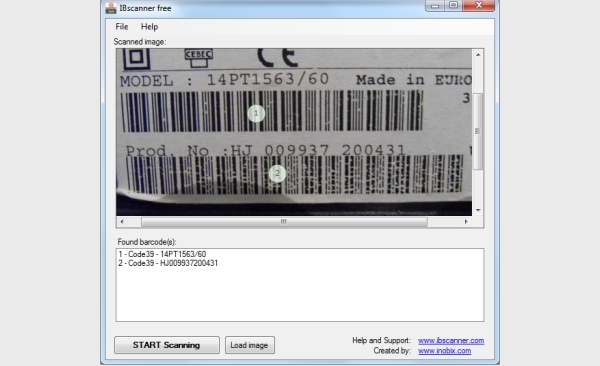 It is a free software which scans barcodes from computer webcam and is used to scan data for different processes. It is simple software with a natural interface where you can scan different codes according to your need. It can read and scan more then 10 linear barcode types. It supports JPEG, TIFF, PNG, GIF files. 100% free software for business and personal use. Compatible with Windows XP and later versions. We have tried our best to cut out your task in searching for an efficient, easy, fast and reliable Barcode Scanner software. Pick out the one which appeals you the most and the one which supports a huge array of scanning formats.